Buffalo sculptor and painter Ellen Steinfeld, whose work is well known throughout North America, has created a beautiful sculpture for the reopening of the recently renovated JCC Holland Family Building, at 787 Delaware Avenue. The sculpture is a reflection of the JCC’s mission to be inclusive and diverse. While the central theme of the work incorporates a Menorah and Doves of Peace, the pathways also connect to a home, neighborhood and community center. Dedicated by Richard and Karen Zakalik, in honor of the commitment, generosity and leadership of the family of community leader Nathan Benderson, it is hoped that these Jewish values will inspire all who enter the facility, which is intended to be a center of communities. In acquiring the piece, the JCC joins a prestigious list of art collections including the Albright-Knox Art Gallery, the New York State Museum, the Castellani Museum, the Burchfield-Penney Museum, Washington State Art in Public Places Collection, the State of Florida Art in Public Buildings Collection and many others. Steinfeld has received numerous large-scale public and private commissions including the monumental steel sculpture for the atrium of Roswell Park Comprehensive Cancer Center and an exterior stainless-steel sculpture for the new Upstate Cancer Center in Syracuse, NY and a large exterior stainless sculpture commemorating the Ride for Roswell. Works in various media have been selected and incorporated into public spaces, hotels, museums, airports, stadiums and corporate collections. Steinfeld’s artwork has been exhibited in museums and galleries in more than 30 solo exhibitions and included in more than 90 group exhibitions in the US and Canada. She was selected to represent New York State for the Absolut Statehood Campaign, which helped raise millions of dollars for AIDS research. She is a recipient of fellowships from the New York State Council on the Arts and also a visiting artist, lecturer and teacher at several universities. Ellen Steinfeld is also the subject of two documentary films. 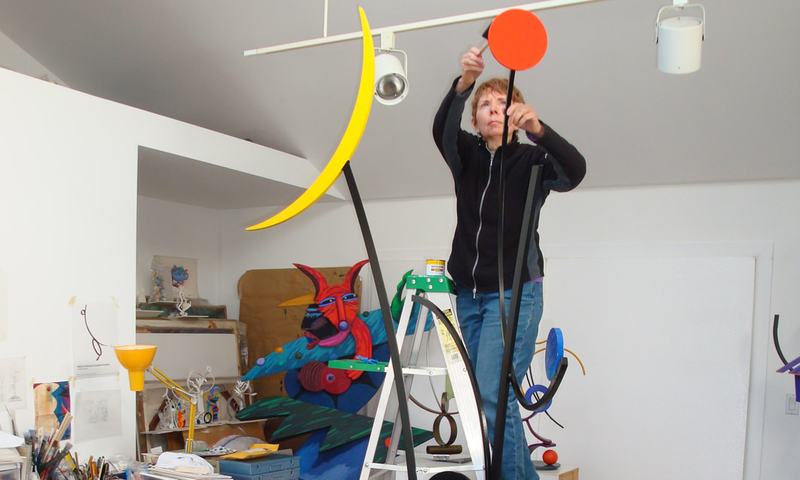 To learn more about the JCC sculpture, we asked Ellen to take a break from her work and talk with us about her recently completed commissioned sculpture which will be installed for the reopening of the Holland Family Building, Jewish Community Center at 787 Delaware Avenue. How have you evolved as an artist during your career? After getting undergraduate and graduate art degrees I taught and lectured at universities, exhibited widely throughout North America, worked on major public commissions in various media. My work is in the permanent collections of many private collectors and museums. What is the concept or ideas that you are expressing with this sculpture? The sculpture’s imagery and symbols are designed to be welcoming, inclusive and unifying for everyone entering the Jewish Center. The central image, a house, symbolizes the Center with various paths leading to it, is a form everyone can relate to. Other recognizable images in the sculpture include the Doves of Peace, a Menorah, the sun, flowering branches and trees. How do you work? Can you describe the sculpture and talk about the process of building it? What materials are you using, do you start with sketches, and what is the process that you use? I always start a concept by making many drawings. I never run out of ideas and usually deconstruct and reconstruct the original composition many times. Creating is a process of constantly making decisions. When transferring a two-dimensional drawing into three dimensions, I also make many changes which often redirect the entire composition. After finalizing a drawing for this sculpture, I made a small model that I submitted to the art committee for approval. Then I started working with a CAD (computer assisted design) programmer to convert all the sculptures’ shapes into a digital file which is necessary to cut exact steel shapes. Several iterations were required to refine the pieces to make sure they would fit together. We do this by using a laser cutter to cut cardboard shapes out at a small scale which I then assemble. When I am satisfied that the shapes are correct, I ordered a four by eight-foot sheet of stainless steel. This was sent to a company that has a dedicated stainless-steel waterjet cutter. Stainless was selected for the sculpture for ease of maintenance and longevity. I send them the digital file and they use that to drive their cutter. The cut steel shapes were then transported to a fabricator. Using the last small model as a positioning guide, we assembled and welded the sculpture. Six threaded 8” long threaded stainless rods were attached to the back of the sculpture which will be inserted into predrilled holes located on the exterior façade of the building’s entry. Can you describe a typical day while you are working? Most professional artists are very devoted to their work. Unless I am at the fabricator’s shop I work almost every day in my studio while also using all the surfaces and spaces of my home. My whole house is really a sweat shop! My husband, Ed, is an architect, and he designed renovations when we first moved in to make the house into a studio and gallery. I also have a large wood shop and paper making studio. I have hosted many studio visits organized by museums, arts groups, and community organizations. When I am working under a deadline, I work seven days a week. Living in my workplace makes it possible to for me to work whenever I want. My husband says that the house is so cluttered with steel he can’t move around safely. My family and friends are very patient hearing construction details about each project. What are three words or phrases that you’d use to describe specifically this piece? How do you think people will react to the art? Hopefully it will be art that enriches their lives.